My first Anna Sui purchase is the lovely Rose Cheek Color in 100 Mystic Rose which was released this month (see a preview here). I was so excited for this. Especially since it's my first Anna Sui experience. Don't get me wrong, AS makeup has always looked fairly enticing, and when I've seen their beauty counters, they're lovely, but I just never felt passionate enough about any of their releases to warrant a purchase. Also, this stuff ain't cheap. 6 grams of product retails for ... um... okay I couldn't find the price quickly, but Ichibankao have it for 4550 yen. Obviously that includes a bit of a markup and shipping/handling fees. First a look at the packaging. Rose Cheek Color comes in a light-weigh black case. Anna Sui appears branded in metallic purple, I know it looks different above, sorry that was glare from the window. I think I expected it to feel a bit heavier. I guess I got used to Jill Stuart or Lunasol and was expecting something a bit more for the price tag. Don't get me wrong, it's not bad packaging, but I guess I was imagining more. It's also worth mentioning that it doesn't come with a brush, although hopefully the photos illustrate that! It is a mirror compact however. A dusting of rose blossoms create the soft sheen of new romance. Use a single color or create your own original favorite color by mixing the shades. Moist Powder Base enhances clear color development and a long-lasting pearly sheen. A blend of highly transparent oil-mix and Clear Sliding Powder helps color to retain a dewy, glossy finish. 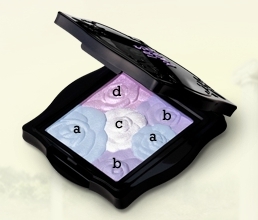 Mystic Rose is a highlighter or illuminator rather than a blush. When you open the package, you really get hit with the scent of roses. I love it! But then, I do love the smell of roses. One of my friends commented that it smelled like soap to her. ¬_¬ As with most scented makeup products, I found the scent was lost when it gets applied, so you don't go around with the scent of roses on your cheeks. These are very pale and delicate colours, and really hard to capture with my camera. I tried to swatch each of the colours, but I'm not sure you can really see them all. I have to say they are lovely, and I like the slight shimmer to some of the colours, most noticeably the white orchid colour. I am keen to try one of the blush colours in this collection, but I couldn't decide which shade! I'm still trying to decide! What do you think? Ya know what all this talk of roses reminds me of?